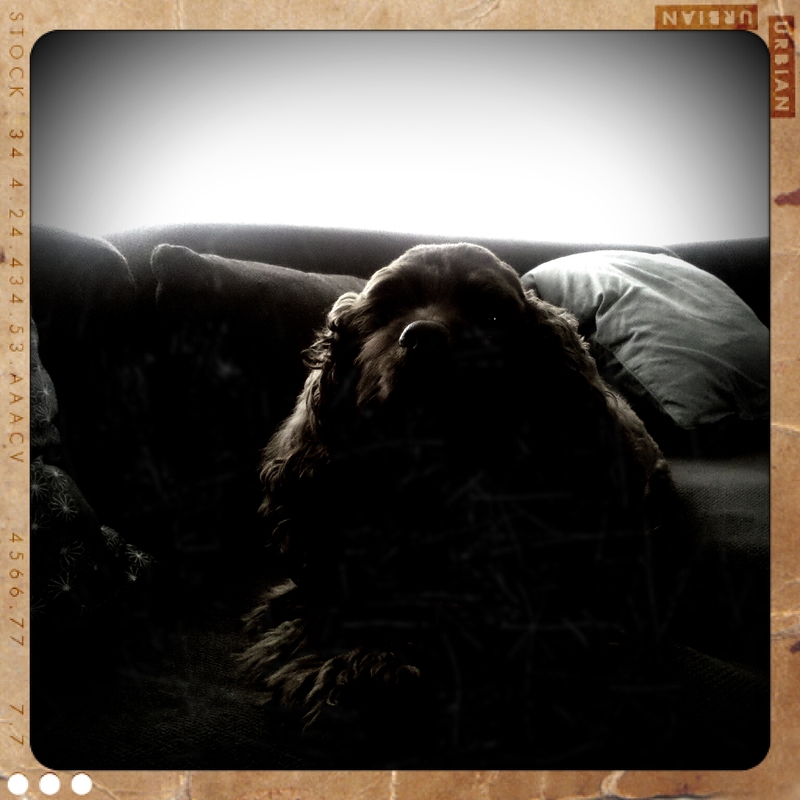 I’m trying out a new app on my Droid called Retro Camera. Guess who turned 6 years old on Wednesday? Sorry for my absence this week. Aside from my day job I’ve been soaking up lots of Jason time: going out for dates, meeting up with friends, taking a day trip to IKEA, working on landscaping projects in the dark, entertaining new friends at our home, watching shooting stars from a hot tub on a cool night … we’ve been been busy, y’all! Bonus phone photo this week: Lucy sticking her tongue out at me after I gave her a bath and a haircut. I’m tired of typing and retyping this story so I’m going to copy this from an e-mail I wrote Tuesday. In short, Lucy was attacked by 2 pit bulls who got loose Monday morning. In trying to rescue her, while the owner was trying to get control of her dogs, my right hand got cut, punctured & bruised and my right knee got scraped up. Lucy is miraculously unhurt. (Seriously, this must be a miracle!) and I’m confident my hand and knee will be fine in a few days. It could have been so much worse. Thank God it wasn’t! Here’s long story of what happened. Our friends Leila and Jeremy live down the road and around the corner from us. Their house was slowly flooding on Sunday. J is out of the country but on his way home now. We helped Leila on Sunday get out some of her most important items out, move most of the cars/scooters out before they got flooded, etc. Sunday night at 11pm the water was just about at the foundation line (but several feet deep in the yard). Monday morning when I woke up I decided to walk Lucy down to their house to see how things had changed. The water had come up about 4′ and stayed that way most of yesterday. Right after Lucy and I got down to the edge of the water a neighbor’s two pit bulls got loose out of their back yard and starting charging at Lucy and I. The owner was in her front yard. She yelled “Pick up your dog!” as she took off running after them. In my 2 or 3 seconds to react I decided that picking up Lucy would probably result in me being knocked down by the two dogs that probably each weigh as much as me. They just sniffed for a second and then started jumping on her and biting. It was so scary. I just kept yelling “No! No!” at the dogs. It was probably only a matter of 30 seconds before the owner got her dogs under control. I was trying to pull Lucy away. She was trying to pull her dogs back and at one point, as I tried to pull one of the dogs off of Lucy my right hand made contact with teeth. I scooped Lucy up right away. Another friend and neighbor was there and I asked if I could put Lucy in her car so she could take us somewhere. Right about that time Leila and her brother Nate pulled up (coming to check on the house). I asked them to take us back home to survey what had happened. Blood was dripping and I was sure Lucy had been cut somewhere. I mean – I could see the dogs mouths around her – I was right there! But we couldn’t find any cuts or puncture wounds on her anywhere. Besides being in shock and pooping and puking for a few minutes, she seemed totally fine. My hand stopped bleeding pretty quickly and within a few minutes my parents came over and my nurse-mama cleaned me up and bandaged up my hand. I also scrapped up my knee pretty bad on the concrete. This morning Lucy and I are both pretty sore and moving a little slow but she still seems to be fine. My fingers are a little bruised and swollen and I’m taking antibiotics to prevent inflection. It could have been so much worse and I really think it’s a miracle that Lucy is OK. I’m confident my hand will be fine in a few days. You are currently browsing the archives for the Family: Lucy category.